Lil'Diggity with sneeze guard has 15" of cooking surface on 10 tubes. 2 heat controls so you can cook and hold up to 14 hot dogs at once. Dimentions: 21" W x 17-5/8" D x 10-1/2 H; Weight: 48 lbs. 1000 watts, 8.3 amps, 120 volts. 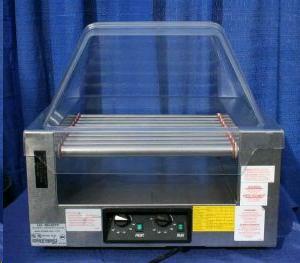 * Please call us with any questions about our hot dog cooker roller grill rentals in Sacramento and Citrus Heights, serving Auburn, Placerville, Woodland, Davis, and Elk Grove in the Sacramento area.